To make propaganda, you must be successful and your film must be successful. . . . The most satisfaction I get out of a film aside from its critical and financial success, is its contribution to the thinking of people, socially or politically. In this sense, every film is propaganda. But, of course, propaganda must not look like propaganda. As I saw it, Mrs. Miniver was perfect as propaganda for the British because it was a story about a family, about the kind of people audiences would care about. In an evocative statement on his 1942 film Mrs. Miniver, William Wyler, famed Hollywood director and vocal advocate for wartime intervention, argues that his film “about a family” is, for all intents and purposes, propaganda. Watching Mrs. Miniver today, the film’s interventionist position is impossible to miss. That art can also be propaganda is, of course, an argument frequently made by cultural critics such as Walter Benjamin (in the final pages of “The Work of Art in the Age of Mechanical Reproduction”) or George Orwell, who famously claimed that “all art is propaganda” but “not all propaganda is art.” But Wyler’s reflection holds special significance for its focus on the politics of the family drama and his suggestion that the domestic is political. As I will argue, Mrs. Miniver and similar family-centered films are propaganda not only because of their wartime content and release dates, but because they are shaped by an underlying structure of melodrama, which, by the 1940s, already had a theatrical and cinematic reputation for making social and economic appeals. In fact, the melodramatic narration of Mrs. Miniver, and indeed of a number of Metro-Goldwyn-Mayer’s (MGM’s) domestic dramas produced during the war, including Goodbye Mr. Chips (1939), The Mortal Storm (1940), Random Harvest (1942), and The White Cliffs of Dover (1944), was a large reason for the film’s success both as art and propaganda. Because melodrama shares many of the same formal features (and history) as propaganda, its use in wartime Hollywood adaptations of late-modern British literature is a significant reason why even the most domestic of films implied a narrative of global strife and a battle between good and evil. That there is a connection between modern literature, film, and propaganda is nothing new. Mark Wollaeger, for example, suggests that modernism and propaganda are two sides of the same coin because they are “proximate information practices operating within a system of interrelated practices.” In other words, the two share a media environment. Information networks such as the newspaper, cinema, radio, and the postal system—and the communications technologies associated with these networks—are essential to Wollaeger’s understanding of the early twentieth century media ecology and its undeniable influence on modern artists such as James Joyce, Virginia Woolf, Joseph Conrad, and Alfred Hitchcock. But where Wollaeger writes about external information systems and mass media as a means to understand high modernist engagement with state-sponsored propaganda, I am interested in the ways the domestic—the home, its architecture, and household objects—narrates its own politics and propaganda from within middlebrow late modernism and film. In theories of literature and film, domestic objects have a history of signifying significant moments of change, be they political, economic, or cultural. For Thomas S. Davis, objects found in late-modernist literature relay messages of “structural transformation in the world-system” such as war or the threats of fascism, communism, and nationalism. Far from being neutral, Davis argues, the late modernist turn to the everyday is inherently “aesthetic and political.” Similarly, Laura Mulvey claims that images of the home and its furnishings in film and television melodramas are steeped in social and political significance for the “ordered national consensus.” In what follows I take up the claims of Mulvey and Davis and explore three spaces traditionally considered feminine (and therefore not high art) and all-too-often dismissed as apolitical (or at least not politically threatening): the middlebrow, the melodrama, and the domestic. These feminized spaces, especially as they appear in home front literature and film from World War II, are, I argue, politically charged; at times they narrate an alternative to the politics of the day by way of carefully crafted settings and a focus on everyday objects and activities. In so doing, I take a different approach to the reading of late modernism than do Marina McKay and Patrick Deer, whose own excellent works on World War II literature and culture primarily focus, like Wollaeger, on high modernist writers and forms. Although I could have selected any number of transmedial and transatlantically-adapted texts, Mrs. Miniver proves a particularly fruitful example due to the overwhelming popularity of both its print (British) and film (American) versions. Given the film’s stereotypically feminine and wifely protagonist, the politics of Mrs. Miniver have either gone unnoticed by literary scholars (as with Struther’s original articles) or been dismissed as melodramatic exaggeration by critics and viewers (as with the film). By reading the architecture and household objects found in Mrs. Miniver as expressing a kind of feminized politics, I seek to complicate Wollaeger’s understanding of propaganda and modernism as being influenced by state-sponsored media structures. I show, rather, that in the new era of total war all structures—social, narrative, cultural, industrial, even architectural and domestic—were engaged in narrating wartime propaganda, even if at times these home front objects strayed from the prevailing message of the day. Melodrama is the fundamental mode of popular American moving pictures. It is not a specific genre like the western or horror film; it is not a “deviation” of the classical realist narrative; it cannot be located primarily in woman’s films, “weepies,” or family melodramas—though it includes them. Rather, melodrama is a peculiarly democratic and American form that seeks dramatic revelation of moral and emotional truths through a dialectic of pathos and action. It is the foundation of the classical Hollywood movie. By declaring melodrama the “fundamental mode” of American film, Williams overturns the dichotomy famously put forward by David Bordwell, Janet Staiger, and Kristin Thompson, in which they describe melodrama as the antithesis of realism, the building block of classical Hollywood cinema. For Williams, melodrama is a structural component of realism, and as such the true backbone of American motion pictures. While Williams focuses on film, the notion that melodrama is more mode than genre also holds true for other art forms. Peter Brooks, for example, writes of melodrama as a “mode of excess,” an essential part of numerous literary genres that dabble in the imaginative. Melodrama’s combination of “pathos and action” is part of what makes the mode so flexible and helps explain why the theorizing of melodrama is frequently paired with politics and propaganda. Even Frye, who writes disdainfully of melodrama in Anatomy of Criticism, makes an interesting connection between melodrama and persuasion. In this encyclopedic study of genre, he labels melodrama as part of an ironic age, to which advertising and propaganda also belong: “These arts pretend to address themselves seriously to a subliminal audience of cretins, an audience that may not even exist, but which is assumed to be simple-minded enough to accept at their face value the statements made about the purity of soap or a government’s motives.” Although Frye drastically underestimates the political power of melodrama, propaganda, and even advertising in the twentieth century, in part because he understands melodrama as only dealing in a binary system of good and evil, the connections he makes between these “arts”—and these arts as modern forms—underscores the reason why melodrama and propaganda should be understood as sharing a similar structure. Over the past decade, film scholars have begun to flesh out this connection. Frank Kelleter and Ruth Mayer, for example, point out that “the melodramatic mode has always lent itself to stories of power struggles and to enactments of socio-cultural processes of marginalization and stratification” (“The Melodramatic Mode,” 9). In fact, according to Coral Lansbury, the interweaving between melodrama and political propaganda should come as little surprise given that even famous political tracts, such as The Communist Manifesto with its focus on social evil, violence, and ghosts, owe a great debt to the melodramatic mode. The binary system upon which melodrama was assumed to be built—good vs. evil, moral vs. immoral, hero vs. villain, clean shaven vs. mustachioed—is also being reassessed in current film scholarship. Part of this reassessment involves seeing the melodramatic form as more ambiguous and ambivalent than previously thought, especially when it comes to reconciling uncomfortable similarities between hero and villain. In his extensive work on early-twentieth century melodrama, Ben Singer lays out a very important clustered definition of melodrama that will prove useful in thinking through its formal similarities with propaganda. For Singer, melodrama is not so amorphous that it cannot be recognized; however, the meaning of the term does shift depending on the use case and medium, much as with propaganda. Singer identifies five basic features that combine in multiple ways to express the melodramatic: 1) a strong sense of pathos leading to emotional identification with the characters; 2) a portrayal of overwrought emotions such as pity, fear, jealousy, hatred, envy, and lust; 3) a simplified worldview in which characters are clearly identified with ethical statuses; 4) the inclusion of chance, happenstance, and coincidence to move the plot forward; 5) the emphasis on spectacle in the form of violence, action, and peril. Emotion, empathy, ethics, chance, and violence—this is a list that seems built for wartime films. And while for Singer melodrama remains very much a genre tied to a specific period in time, from this list’s breadth one can see why Williams claims that melodrama is the underlying narrative mode of all classical Hollywood films, as any combination of these five traits would be at home in dramas, film noir, musicals, combat pictures, comedies, and so on. From these five attributes, one can also begin to see the formal similarities between melodrama and propaganda. Like melodrama, propaganda is a mode that crosses genres and mediums, but its amorphous nature does not mean that it takes on all the characteristics of that genre or medium. As Jonathan Auerbach and Russ Castronovo write in The Oxford Handbook of Propaganda Studies, “Propaganda changes according to specific media, but cannot entirely be defined by the attributes of a given medium.”  In fact, because propaganda is not completely determined by the distributing medium, it adapts well across media, albeit in “enhance[d]” or “diminish[ed]” forms. Thus, a propagandistic message like “Keep mum—she’s not so dumb!” can be articulated in novels, plays, films, radio broadcasts, government pamphlets, and even comic books, with varying degrees of success. The same, as Williams points out, is true for melodrama. Another shared feature of melodrama and propaganda is the exploration of an emotional range. The binary relationship of good versus evil is usually not pathetically nuanced enough to persuade people in mass. This means “propaganda must harness a rich affective range beyond negative emotions such as hatred, fear, and envy to include more positive feelings such as pleasure, joy, belonging, and pride” (Auerbach and Castronovo, “Thirteen Propositions,” 10, emphasis in original). But while melodrama and propaganda exploit an array of spectator emotions, there is, as Laura Heins points out, a deliberate avoidance of what she calls “low-contrast shades of facts and details” (Nazi Film Melodrama, 2). For both melodrama and propaganda to be effective, the narrative of allegiances must be clear. Of course, Hollywood, and particularly those directors, like Wyler, advocating for intervention, knew that the best propaganda was propaganda seen by a large number of Americans. Translation: the film had to be box office gold. To be effective interventionist propaganda, therefore, especially in the early war years, films had to be both escapist entertainment and a reminder that the threat to the American home front was real. The melodramatic mode proved a perfect means of infiltrating multiple genres with war-related content, references, or even just a general sense of unease. As the European war raged on, depictions of combat, loss, and sacrifice on both the front lines and the home front became more direct. After Pearl Harbor, the main studios actively cooperated with the war effort, and in particular the American Office of War Information (OWI), which consolidated propaganda messages delivered both at home and abroad. However, even during the earliest years of the European conflict, MGM had tremendous success in creating a series of domestic dramas that were simultaneously escapist and interventionist, including Goodbye Mr. Chips and The Mortal Storm. A large part of this success lay in the studio’s sophisticated use of melodrama. But another key factor to MGM’s box office victory—a factor that should not be underestimated—was that the studio frequently turned to already successful late-modernist middlebrow literature that centered English life and politics around the home and familiar domestic activities. This formula of adapting popular middlebrow literature for film and inflecting the existing print narrative with new or additional war-themed melodrama for the cinematic version, however, led to two very different depictions of the war, and in particular Britain’s response to it. Set in the late 1930s during the lead-up to World War II and the start of the Phoney War, Struther’s articles for the London Times, published between October 1937 and December 1939, show a British nation still hopeful that war could be avoided. “Far from being an exemplary tale of the ‘suffering and courage of civilians in all-out warfare,’” as we see in the film, writes Alison Light, the original essays were instead “a feminine hymn to [Neville Chamberlain’s] ‘peace in our time.’” As such, Struther’s Mrs. Miniver now reads as rather unaware of the historical moment, with the family only at the very end realizing the dangers posed by Hitler and the spread of Nazism. The Hollywood adaptation, however, tells a very different story, in part because the film needed to reach a war-wary American audience. Where Jan Struther and other British authors depicted Britain as unprepared for combat, Hollywood filmmakers portrayed a Britain that was strong, capable, and ready. On screen, the Minivers are fighters and survivors, not ostriches sticking their heads in the sands of appeasement. This change fell directly in line with the propaganda message Britain’s Ministry of Information (MOI) wanted Americans to hear. Americans needed to see a Britain worthy of saving—a Britain that was holding her own, a Britain whose culture was intrinsically tied to America’s. Hollywood, it seems, was happy to deliver. Released in 1942, MGM’s Mrs. Miniver would go on to sweep the 1943 Oscars and run for a record-breaking 10 weeks at Radio City Music Hall. The domestic drama was a runaway success, popular with the US public and government alike. Focusing on middle-class life, the adaptation articulates a family’s struggles due to external and unpredictable wartime pressures. And by moving the film’s setting from London, a site associated with bombings, espionage, and loss of life, to the idyllic and heavily-fictionalized British countryside, Wyler was able to subtly express a key British propaganda message: no one and no place was safe. It needs noting that the plot of Mrs. Miniver the movie is fundamentally different from Struther’s original version, so much so that calling the film an “adaptation” seems a stretch. In fact, Struther’s narrative is so completely transformed that the movie follows the articles largely in name only. Struther presents the war as a hardship of equal magnitude to mundane activities like visiting far off friends, or finding household help. The film takes a necessarily different approach and centers on the war. But the movie also had to fit MGM’s famous prestige format and follow the goal-oriented, single-narrative plot as required for a Hollywood production. MGM, of course, relied on the star power of Greer Garson, the studio’s reigning queen of prestige pictures, to tether the movie to its brand. But the striking differences between the text and the film suggest more than the requirements of the American film industry. This adaptation also attests to the different strategies required to sell the war to different audiences. Whereas Struther needed to present the potential conflict as a minor interruption to Britain’s way of life, the movie needed to convince an American audience of British fortitude and reflect the United States’s new reality as a nation at war. Such targeted transatlantic messaging was common. For example, a few weeks after the bombings in London began, Humphrey Jennings and Harry Watt, working with the MOI, crafted the propaganda documentary London Can Take It with an American audience in mind. American journalist Quentin Reynolds was asked to write and provide voiceover for the film and even toured the United States upon its release (including a screening for President Roosevelt). The film showed British civilians carrying on with their daily lives despite the destruction of the Blitz. Even after the war’s end, culture makers continued to rebrand the British experience of the war as unremarkable rather than dramatic. In the 1946 American release of her short story collection Ivy Gripped the Steps, Elizabeth Bowen apologies to readers that the stories “do not contain more ‘straight’ pictures of the British wartime scene” and asks readers to “remember that these impulsive movements of fantasy are by-products of the non-impulsive major routine of war.”  Bowen here essentially removes the melodrama from the war, claiming instead that her fantastical “wartime, none of them war, stories” were written in answer to the mind-numbing routine of actual war (Ivy Gripped the Steps, vii, emphasis in original). Like the presentation of daily perseverance in London Can Take It, Bowen upends American expectations of war drama in wartime stories. Before turning to MGM’s wartime masterpiece, we need to understand Struther’s version in relation to the politics leading up to WWII. Rather than being about war, Struther’s articles generally fall in line with Chamberlain’s appeasement policy; on many occasions Mrs. Miniver’s reflections match the political response of the London Times, the paper that largely supported the government’s policy of conflict avoidance. Despite this, Struther includes small, subtle moments that capture the British public’s anxiety over a potential war. Before the war’s outbreak, Struther had been encouraged by her editor to include some of the current political situation in her articles, and while she reportedly “did not want to raise the decibel level of her prose by inserting ill-informed comments about Hitler and Mussolini,” her stories do provide glimpses of the effect the political turmoil was having on Britons’ everyday life (Graham, The Real Mrs. Miniver, 98). For example, “Gas Masks” shows the Miniver household preparing for the worst. Written only days before the Munich Agreement, this chapter focuses on the inconvenience of being fitted for a gas mask rather than any form of anxiety about a coming war. In fact, the most overtly political moment of this chapter, and perhaps of all the articles, is when Mrs. Miniver makes a case against nation-baiting propaganda: “But this time those lunacies [speaking of WWI]—or rather, the outlook which bred them—must not be allowed to come into being. To guard against that was the most important of all the forms of war work which she and other women would have to do.” For Mrs. Miniver, this work starts with informing her children of the differences between fighting an idea and fighting a nation. She is adamant that the jingoism of 1914 not be repeated; this time around there would be no “boycotting Grimm and Struwwelpeter, or looking askance at their cousins’ old Fraulein” (Struther, Mrs. Miniver, 75). Yet what makes such expectations of reasoned thought (even from small children) political propaganda is that Mrs. Miniver’s calm response to purchasing gas masks and her insistence that 1938 will not be a repeat of 1914 aligns with the government’s appeasement policy, which was openly supported by The Times. In the leader “The Issue Defined,” published in the same issue as Struther’s “Gas Masks,” the author encapsulates the very essence of Chamberlain’s approach, namely anything and everything must be done to avoid a repeat of the First World War. For The Times, as for Mrs. Miniver, the true hero is the one who brings peace: “No man can yet say whether Mr. Chamberlain’s heroic labours are to be crowned with the only success that can bring him an adequate reward—the preservation of the peace of the world.” Despite the hope that an agreement with Hitler could still be reached, the Minivers, like many in Britain, prepare for the worst. Mrs. Miniver’s husband Clem, for example, joins an Anti-Aircraft Battery, while the maids prepare for refugees and the children’s school is evacuated to the countryside. Even Mrs. Miniver joins the cause by signing up to be an ambulance driver (Struther, Mrs. Miniver, 79). Two months later, on November 29, Struther once again incorporates the heightened political climate into Mrs. Miniver’s everyday routine when she notices “‘JEWS’” printed on a newspaper during her walk to pick up her children from school. Upon seeing this word, Mrs. Miniver reflects on the importance of empathy, of “feeling [pain] to the utmost,” and of the need for “money, food, clothing, shelter” for the influx of refugees entering Britain (87–88). Although Mrs. Miniver does not directly mention refugees in “A Wild Day,” readers of The Times would have understood the reference, for not only were refugees a topic of discussion in this specific Times edition, but “A Wild Day” was published only three weeks after Kristallnacht (fig. 1). Fig. 1. 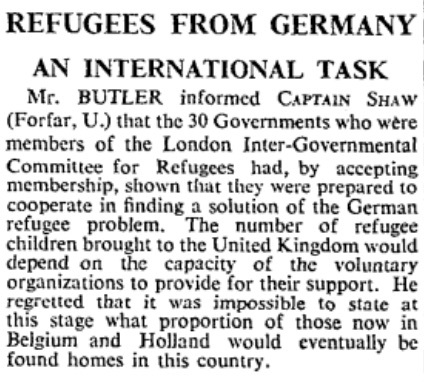 “Parliament,” Times (London), November, 29, 1938, 8. Despite the inclusion of subtle political references, British fans of Mrs. Miniver found comfort in Struther’s focus on the domestic and everyday, and upon the conclusion of the series, wrote letters requesting that Mrs. Miniver return to the newspaper. Mrs. Miniver’s reflections on home life reminded Britain of simpler times that did not involve a civilian army or total war. But the domestic should not be confused for a neutral space. Even in Struther’s Mrs. Miniver, household objects have a distinct political message, one that articulates the continued freedom and security of a Britain that can keep the peace. Light, in Forever England, has written extensively on the politics of domestic spaces as they pertain to the middle-class woman’s independence, and certainly Mrs. Miniver’s journaling and mental control over spaces within and without the home support this claim. But the accumulation of household objects in Mrs. Miniver—often collected, hoarded, and mourned over when lost—also imply the perpetuation of a comfortable domestic and national status quo. For if, as Light argues, “Mrs. Miniver suggested that it was private life that constituted the real and important life of the nation,” then it should be no surprise that this private life absorbed and disseminated the politics of the nation it represented (Forever England, 145). People whose homes had been blown up went to infinite lengths to assemble bits of themselves—broken ornaments, odd shoes, torn scraps of the curtains that had hung in a room—from the wreckage. In the same way, they assembled and checked themselves from stories and poems, from their memories, from one another’s talk. . . . And [the writer] was aware of the passionate attachment of men and women to every object or image or place or love or fragment of memory with which his or her destiny seemed to be . . . assured (xi). While collection here is specifically tied to maintaining an individual identity and a semblance of normalcy during the war, there is a sense in which Mrs. Miniver’s accumulation of goods in the lead up to war, although not in itself a political act, implies that security both within and without the home is still feasible. Moreover, the control Mrs. Miniver exerts over everyone and everything with which she comes in contact suggests Britain’s leadership position on the world stage. With Britain on the brink of war, even after the declaration of “peace for our time,” the Minivers seek comfort in a small, warm room, one that Light interprets as reassuring to the readers in a difficult time. And while certainly the room is cozy and the family activity of fortune telling enjoyable (not to mention hopeful), the language Struther uses to describe the domestic space and its objects is laced with weakness and uncertainty. The very windowpane keeping out both cold and the “inexplicable world” is “frail,” and its soon-to-be-broken quality is emphasized by Mrs. Miniver’s acknowledgement that not only are spaces like this rare (“here at least”), but they are also fleeting, lasting for “moments” that will be infrequent over the next year. Far from reassuring readers, this scene subtly illustrates the external threat to British domesticity with which The Times was not ready to engage. While readers may have viewed Struther as comforting and neutral, her strategic use of household objects reveals her politics of appeasement and her fear of an unstoppable war. Thus, while Struther’s Mrs. Miniver may appear apolitical, especially in comparison to the film version, the articles were, in fact, steeped in the political propaganda of the day, at times even questioning the prevailing government line. And because these politics were wrapped up and tied with a neat domestic middlebrow bow, Mrs. Miniver effectively won fans on both sides of the Atlantic without being perceived as explicit government-sanctioned propaganda. In fact, Struther’s book was so successful in the United States, a nation on the lookout for British interference in American isolationism, that it sold as much as 1,500 hardback copies a day. The American public’s appetite for this book made it very attractive to Hollywood. Director and producer Sydney Franklin was particularly interested in the adaptation and hoped that the film could be turned into an MGM “topical prestige picture” (Troyan, A Rose for Mrs. Miniver, 124). It is under Franklin that the prewar setting of the novel was transformed into a wartime domestic drama similar to another MGM success, the Jimmy Stewart and Margaret Sullavan vehicle The Mortal Storm (1940), an adaptation of Phyllis Bottome’s novel of the same name. The shift in the primary anticipated audience for Mrs. Miniver from a late-1930s British public for The Times articles to a wartime American public for the film, then, plays a fundamental part in understanding the text’s adaptation. What MGM created was not Struther’s Mrs. Miniver—although there are certainly similarities—but rather a Mrs. Miniver for the United States, a Mrs. Miniver that was, according to Hollywood screenwriter Talbot Jennings, “just the right British for us” (quoted in Troyan, A Rose for Mrs. Miniver, 150). American viewers were meant to experience both sympathy for the British public who were managing to keep a stiff upper lip in the face of annihilation, and fear from the suggestion that the Blitz could happen here. What American audiences may not have noticed, however, was that through a carefully designed set, Mrs. Miniver also subtly constructed the propaganda Britain wanted them to receive, and did so, like Jan Struther, through the most unlikely mediums—architecture and household objects. A key way Mrs. Miniver expresses the devastation of the Blitz is through a carefully manipulated domestic space. Central to the creation of this space was Cedric Gibbons, the film’s art director, and Edwin B. Willis, the set decorator. Gibbons was supervising art director at MGM from 1924–1952, and his name was synonymous with MGM’s glamorous and elegant sets. Gibbons was trained as an architect, and his style is often described as modern; in the 1930s, this implied “clean-ordered lines, the use of arches and moldings, [and] sleek furnishings,” as well as the use of “geometric shapes, high gloss, and refined settings.”  His domestic sets were orderly and avoided over-crowding. Such aesthetics worked particularly well in MGM films, whose average on-screen family “was usually independently wealthy and lived in a mad whirl of cocktail parties aboard yachts, with the source of such unlimited income usually unspecified but taken for granted” (Whitlock, Designs on Film, 56). Willis worked alongside Gibbons in the often-overlooked role of set decorator, acquiring all on-set furnishings, including furniture, draperies, carpets, food, bric-à-brac, and in the case of Mrs. Miniver, even rubble. During his time at MGM, Willis “dressed” an astounding 640 productions. He, as much as Gibbons, was responsible for MGM’s modernist aesthetics and his role as set decorator was essential to the film’s ability to tell a story. As Cathy Whitlock writes, set decorators, and the physical objects with which they work, “provide a true narrative backstory by bringing environments to life through detail and decoration. A sparse, contemporary interior devoid of color and accessories can express the cold persona of the owner, while a cozy, well-lived-in room of accumulated objects can project a feeling of warmth, family, and tradition” (35–37). Sometimes, however, these sets told unexpected narratives of their own. During the war, late-modernist writers such as Virginia Woolf, Graham Greene, Bowen, and Patrick Hamilton, among others, took everyday life in the domestic sphere as a means of articulating the particularly devastating impact the war had on the home front, what Thomas S. Davis refers to as the “extinct scene,” or the familiar domestic spaces where the historical cracks begin to show. Film theorists, however, argue the domestic space and the objects within it not only communicate shifts and stresses in the historical moment, but also explicitly communicate melodramatic tension. According to Thomas Elsaesser, melodramas rely on household things and décor to generate suspense, whereas genres such as westerns and thrillers use the narrative’s plot and action. Or, as Bill Brown writes, “things can grab our attention on film; and they do so because they have become not just objects but actions.” Often centered on a female protagonist and set in middle-class homes, traditional melodramas utilize everyday household items to depict an “increasingly suffocating” space that is meant to represent the protagonist’s struggles with domesticity, enforced passivity, and an exclusive patriarchal society. Although Elsaesser is speaking about melodrama as a genre, the melodramatic as mode can have a similar effect. By way of an example, Elsaesser discusses the opening scene from the WWII film Since You Went Away. In the introduction to this film, the audience sees Claudette Colbert walking through her house, touching objects along the way, and musing on the chaos and uncertainty of her life now that her husband has gone off to war only six days after receiving his orders. For Elsaesser, “The banality of the objects combined with the repressed anxieties and emotions force a contrast that makes the scene almost epitomise the relation of decor to characters in melodrama: the more the setting fills with objects to which the plot gives symbolic significance, the more the characters are enclosed in seemingly ineluctable situations” (“Tales of Sound and Fury,” 84). A similar connection between object accumulation and external pressures also appears in Mrs. Miniver. The film’s architectural space—and the objects within it—emphasizes the devastation of the war on all fronts. The result is a violent sense of suffocation, suggesting to viewers—particularly American cinemagoers—that their own domestic space is also in danger. That objects imply actions or emotional states—what we might call a verbification of household items—makes sense given the temporal significance assigned to filmic objects through the movement of the camera. Film’s temporal nature, writes Lesley Stern, enables objects to serve a “primarily narrative” function for the viewer. Things in film, therefore, tell a story, and at times, this story can run contradictory to the ones lived by the characters on screen. In her discussion of things in film, Stern makes an important but blurred categorical distinction between the “quotidian” and “histrionic.” Such blurring is particularly prevalent in the domestic drama where everyday objects and activities are transformed into the melodramatic through the temporal progression of the film itself: “The function of this gestural regime is to establish quotidian routine as a springboard from which the drama can leap” (“Paths That Wind,” 327). To this I would add that the historical moment within which the film takes place is also crucial for establishing narrative significance. Objects and spaces in wartime film take on a hermeneutic function of their own, a function that is also altered by the process of adaptation. Thus, while everyday objects in the Mrs. Miniver articles narrate a story about appeasement and at times concern over the threat of Nazism to British home life, in the film, these objects are transformed into harbingers of the chaos to come if American inaction continues. Primarily composed of wide shots and an average shot length (ASL) of almost 12 seconds, Mrs. Miniver falls to the longer side of classical Hollywood cinema’s average of 8-11 seconds. The effect of this uniformity is calming, and the combination of long duration with expansive wide shots draws attention to the family’s centralized place within the home, the local community, and the British countryside. This is a family and a nation that does not change pace (both literally and metaphorically) for the war. And while occasional dialogue cuts highlight moments of discord between family members—none of which last very long or threaten their unity—the majority of conversation is filmed in two-shot at eye-level, with pans and tilts favored over cuts, suggesting that familial and national solidarity is steadfast and cannot be broken. Even the soft fades between scenes reinforce the idea that Britain remains unperturbed by the war. However, the film’s mise-en-scène tells a very different story, as an encroachment of displaced household objects upon the domestic space creates both congestion and discomfort. Once war is declared in the film, the Minivers find themselves in increasingly minimized spaces, symbolizing the growing threat of Nazi power to British civilians and, by association, the shared domestic values of Britain and America. Take, for example, the scene in which the Minivers seek shelter from an air raid but still manage to carry on with “business as usual” despite bombs dropping all around them. You see the happily married couple huddled together performing usual evening activities, such as reading a book, knitting, and drinking coffee while their children sleep soundly in makeshift bunk beds. Even their conversation is banal, moving from laundry to the cook to the upcoming flower show. But the objects and setting tell a different story. Prominent frontal lighting illuminates the couple’s faces as well as the piles of daily household items, gardening pots, and gas masks that crowd the already limited family space. This is “functional anarchy” à la Bowen (Ivy Gripped the Steps, 4). In fact the items on the shelf above Clem Miniver (Walter Pidgeon) look as if they will topple, a reminder of the toppling world outside that has forced the family to seek alternative sleeping quarters for the night (fig. 2). This overcrowded domestic space is certainly a striking contrast to the more spacious Miniver home. But this scene and many that follow it also suggest the emerging difference between MGM’s wartime preoccupations and those from the opulent, escapist days of the 1930s. The smallness of this space is highlighted in a shot in which Kay Miniver pours a cup of coffee (fig. 3). This everyday action, enhanced by the continued use of long takes that pan across the bunker from parents to sleeping children, suggests the continuation of family life and unity despite the war. However, read within the historical moment and the setting of the bunker, such a quotidian act takes on a melodramatic significance. Standing in the forefront of the shot, the Minivers appear too large for the space, a largeness exacerbated by the sudden use of a low angle and frontal lighting that casts their shadows, and thereby the couple’s physicality, to the shelter’s roof. A medium close-up shot is used throughout this scene (a notable shift from the film’s usual wide shots that, by its very difference, emphasizes the smallness of the bunker), the effect, due to the close quarters of the sparse bomb shelter walls and growing shadows, is that of an even more stifling close-up. The shelter disappears and our attention is on the Minivers and their everyday actions of drinking coffee and smoking. The result is dramatic. This is a couple in danger; and it may be that even if they emerge unscathed, the spaces around them (already, in this shot, symbolically disappearing) will not. Taken together, these shots, and the larger air raid scene, portray a world that is literally closing in upon the Miniver family and represent British wartime struggles for American audiences. Figs. 2 and 3. 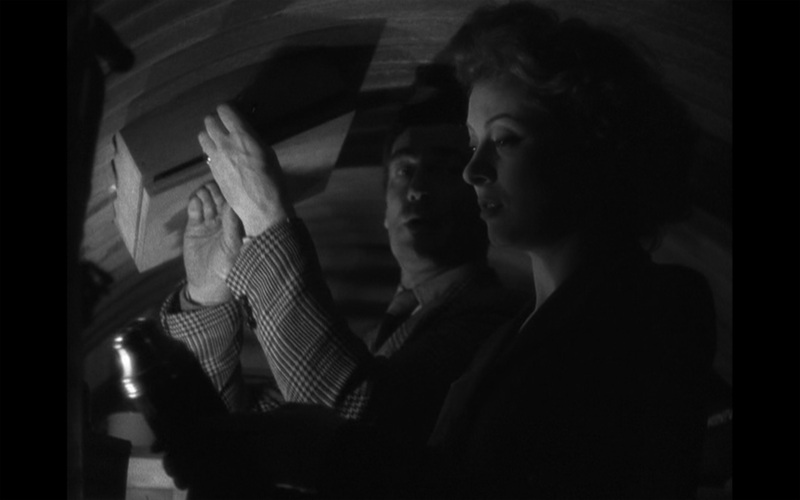 The bomb shelter in Mrs. Miniver. Although the Minivers survive the bombing, space remains a problem for the family. In a striking parallel to Struther’s original articles, it is a windowpane that first implies the Minivers’ troubles are far from over. Shortly after the bomb shelter scene, RAF pilot Vin (Richard Ney), and his wife Carol (Teresa Wright) are shown returning from their honeymoon. 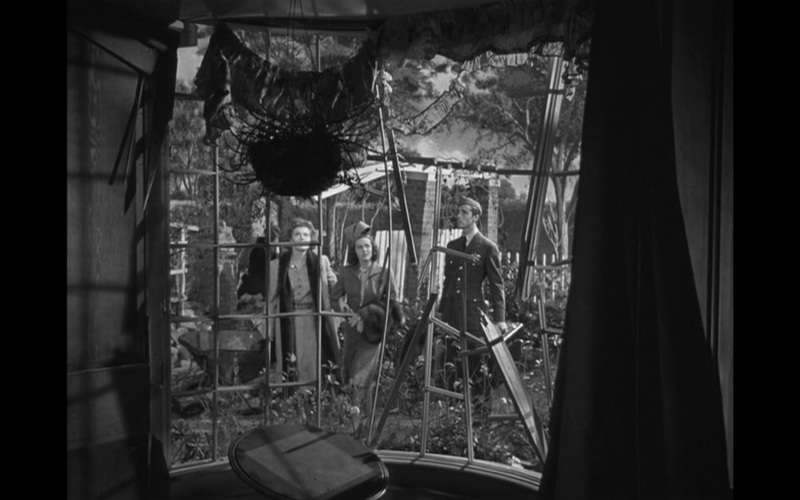 In this shot, the actors are literally framed by a damaged window as they walk up to the Miniver house, their bodies fragmented by broken glass and frame that foreshadow the bodily loss to come (fig. 4). (A similar shot with window intact appears earlier in the film directly after war is declared. Thus the changing condition of this window narrates the stresses of the Miniver family and the British nation.) Moments later, the family is once again crowded by their domestic space, as they tour the damage caused by the bombing (fig. 5). The roof, which has in part caved in, seems to rest inches above Vin’s head, signifying that war has officially interrupted domestic bliss, both old and new. This scene foreshadows Carol’s death in numerous ways. The staircase, which just makes it into the bottom of the shot, will likewise be in the background for Carol’s final scene. In this shot, the original Minivers stay close together on the staircase, suggesting their permanence as a couple and therefore their survival in the film. The newer couple, however, are separated by a chasm of rubble, a symbol of the war that will permanently divide them. Carol’s separation is intensified by the actors’ body positioning; whereas the three Minivers look at the war damage, Carol gazes out the window to her right. Although now a Miniver, her connection to the family is that of an annex, which is exactly what this war-torn part of the house has become. In this former dining room, household objects are hard to isolate from the rubble; one can make out only a fallen chair and a book or two lying amidst the wreckage. In Elsaesser’s terms, the décor—now war debris—expresses the heightened stress of the wartime environment upon middle-class British families. Such contradictory mise-en-scènes, in fact, emphasize the devastation of the war as they serve as visual manifestations of the traditional melodramatic expectation in which an emotional high is quickly followed by a low, or vice versa. Thus, the melodramatic architecture of family bliss in a crowded air raid shelter and honeymooners returning to a bombed home serves both the entertainment and propagandistic goals of the film. Figs. 4 and 5. The aftermath in Mrs. Miniver. Despite the film’s increasing object-centered chaos, Mrs. Miniver ends on an optimistic note, one portrayed through a powerful moment of resilience expressed by a vicar during a Sunday morning church service. This final scene hits a number of propaganda points the British government transmitted to Americans across a variety of media. Central to this propaganda message was that Britain was fighting a “People’s War,” which the eulogy’s writers, Wyler and Henry Wilcoxon (the vicar), cleverly connected to other propaganda motifs, such as Britain’s Christianity, Britain’s egalitarianism, and a British population that carries on with “business as usual” in this home front battle. In this concluding scene, the Miniver family gathers in a bombed-out church to mourn the loss of numerous villagers, including Carol. The setting of the final scene in a church suggests that Britain shares America’s Christian history and values, but it also implies that Germany (which we assume is responsible for the dilapidated condition of the church and the lives lost) does not share this Christian faith. This is emphasized by the congregation’s far from subtle singing of “Onward, Christian Soldiers.” And while the war clearly has a devastating emotional impact on the British public, as articulated through the increasing level of destruction inflicted upon everyday objects and architecture—from falling in the bunker, to debris in the Miniver home, to total obliteration in the church—the message at the conclusion of MGM’s film, emphasized by the continued use of deep focus, wide shots, and standard classical Hollywood ASL, is that the British way of life endures. As with the rose show, which continues despite the looming threat of an air raid, the Minivers and the local town continue to go to church and proceed with their daily routines. The message is clear: Britain can take it. This scene also suggests the popular myth that the war was transforming Britain into an egalitarian nation. The film expresses this egalitarianism in multiple ways in the concluding moments. First, the war takes the lives of both the rich (Carol) and the poor (Mr. Ballard). Second, the Minivers are portrayed as part of Britain’s emerging professional class. As such, it is significant that in the final moments of the film Vin leaves his middle-class family to stand with Lady Beldon, his deceased wife’s grandmother, who gratefully accepts the company of the young RAF pilot. 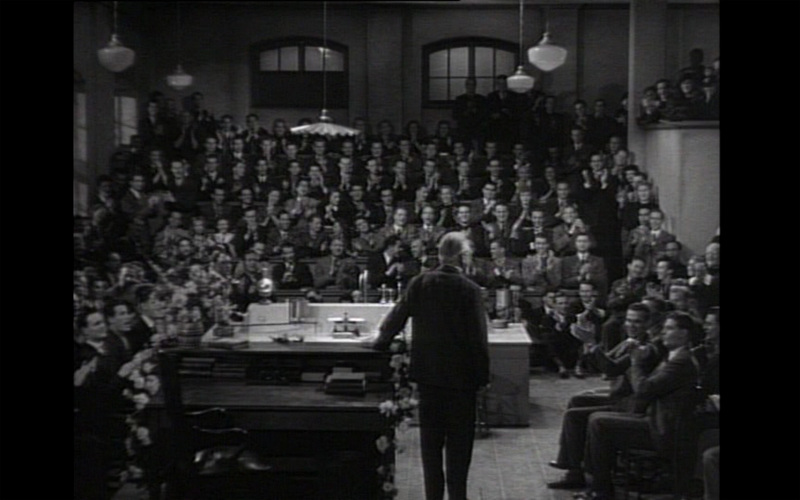 Third, the minister’s speech reminds us that “this is not only a war of soldiers in uniform; it is a war of the people, of all the people.” Finally, even the shot length alters from the lengthier 10-15 seconds used throughout the film to quicker 5-second cuts during the Minister’s speech. During these shorter cuts, the camera focuses on the resolute and injured faces of the congregation, whose composition includes members of all classes. War, it would seem, is the great equalizer of even the British class system (fig. 6). Fig. 6. The final scene in Mrs. Miniver. The architectural space and objects in this scene also reinforce this optimistic narrative of Britain’s survival. Although the church, like the Minivers’ house, has sustained damage in a recent aerial bombing, the space is clear of debris. In fact, the spatial arrangement of the church narrates an opposing message to that of the crowded setting of the bomb shelter and the destroyed Miniver home. The bombings have removed the ornateness of stained-glass windows and decorative beams; instead, the gaping holes in the roof and the simple wood joists suggest a return to Christian fundamentals. In fact religious rectitude is so intrinsically significant to this community that the bombing exposes a wooden cross as structurally imperative to the church’s foundation. 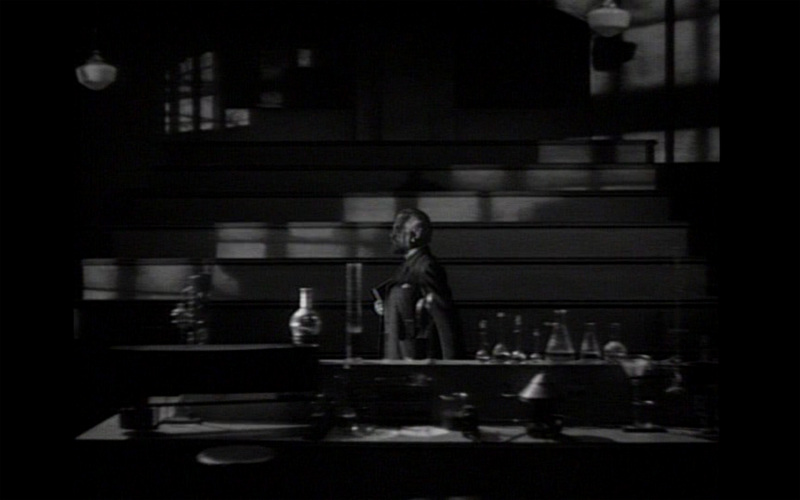 If the previous two scenes, with their crowded, suffocating spaces and crumbling household items, suggest domestic disturbance (and the Minivers’ domesticity is at every moment of this film a stand-in for the British home front), then this final scene, which is cleared of all superfluous objects, suggests that this turbulence will come to an end. In its architectural simplicity and open spaces with broken beams pointing to heaven, the concluding moments of Mrs. Miniver, composed of a long final take that tilts up from the congregation and zooms in on the RAF airplanes flying overhead, hint at a happy end for both the Minivers and Britain’s current melodrama. The suggestive use of domestic objects in this famous home front drama represents part of a larger filmic pattern that sought to imbed wartime politics in a carefully manipulated mise-en-scène. MGM’s The Mortal Storm (1940), for example, also used domestic spaces and décor to communicate a feeling of suffocation both for the characters in the film and the audience. 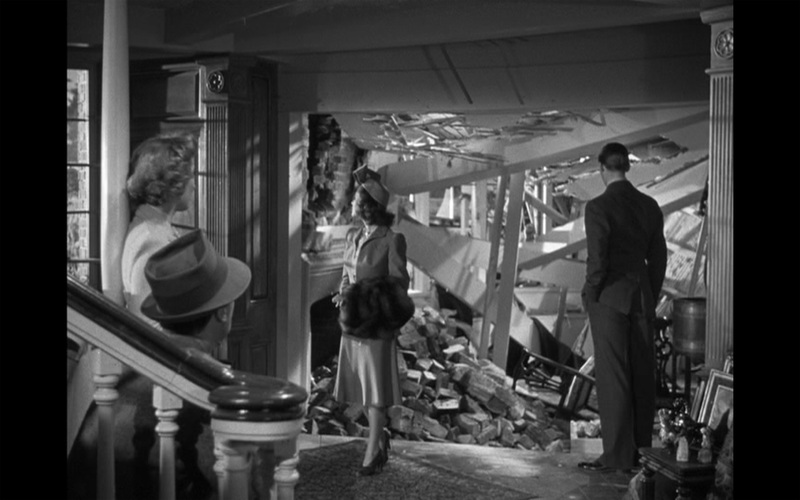 Gibbons and Willis were also responsible for The Mortal Storm’s set design and decoration; but while for Mrs. Miniver they crowded small rooms with too many things to depict wartime stress, in The Mortal Storm they articulated impending danger and stifling freedom through the removal of everything related to home. This use of objects actually fell in line with more conventional MGM set decoration, which equated more objects in the domestic space with economic security. Thus, less décor signifies more insecurity. By the film’s end, it is the jarring lack of people and objects in the domestic spaces that renders visual the true and “mortal” danger of the Nazi regime. Take, for example, one of the earliest juxtapositions of domestic space within the film: the classroom of Professor Roth, the protagonist’s father, which offers the professor a kind of domestic security. 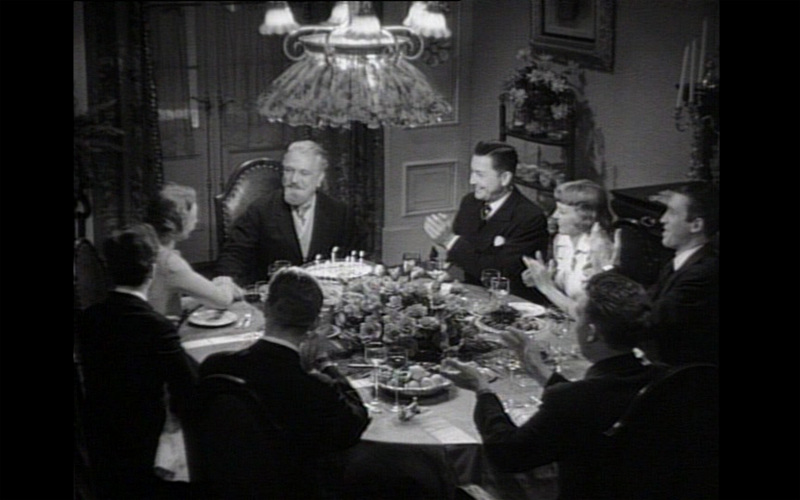 Early in the film, we see Roth (Frank Morgan) celebrating his 60th birthday. In this scene, the camera cuts between lengthier close-ups of Roth giving a speech and shorter cut-aways to family (including his daughter Freya, played by Margaret Sullavan), colleagues, and students who have gathered to pay their respects. Roth stands mid-frame surrounded by applauding acolytes so numerous that they run off the screen (fig. 7). He is the center of the university, and, as the film soon establishes, his family. The use of deep focus shows not only the extent to which Roth is beloved by his community, but also his respected standing within it, as his figure, positioned in the forefront, is larger than those around him. But the power of this early scene comes less from how full the room is than from how empty it becomes only a few scenes later. The once soft lit and populated classroom is now dark and bare (fig. 8). Roth’s students and colleagues have forsaken him and his teachings for a book burning outside. In this scene, the character is once again center frame and in deep focus as the camera pans right to left in one continuous shot following the Professor as he moves toward the glass doors. But whereas in the previous scene the soft lighting casts natural shadows of equipment and students, now hard lighting creates sharp-edged shadows of the glass doors on the left-hand side of the frame. These hard shadows, commonly used to express danger in film noir, spread across the screen as the students once did, obscuring our view. Diagetically, the shadows are produced by the book burning outside the widows; cinematically, however, the switch to hard lighting suggests the dangerous spread of fascism within the university and local community. The barrenness of the room, unused scientific equipment, and empty seats emphasize the professor’s isolation and persecution under the new regime. This is exacerbated by the smallness of the space Roth occupies. Whereas in the previous scene the deep focus, soft lighting, and quick cut-aways make the room feel expansive, now the room is visually cut in half by the growing darkness on both sides of the screen. Figs. 7 and 8. A classroom full and empty in The Mortal Storm. A similar juxtaposition of shots is used for scenes of the family home. The first of these scenes occurs during the beloved patriarch’s birthday dinner and only moments before the family learns that Hitler has been named Chancellor of Germany, an announcement that immediately divides both the family and the space in which they reside. In a staging similar to the first classroom scene, Professor Roth is seated center frame at the head of the table (fig. 9). As before, the room is softly lit, with shadows diffused naturally from people and objects (note, for example, the shadows of arms on the table or the shelf against the right-hand wall). In this scene, however, the relationship between the shots of the Professor and surrounding characters is reversed, with shots of the family lasting around 30 seconds each and interspersed with close-ups of the professor speaking. This shot reversal, paired with the setting of the family sitting around a circular table, emphasizes his speech’s subject: family unity. The use of space in this shot is again expansive. The family fills the entire frame. In fact, the house is so filled by the family and their love for one another that the brothers and family friend, Martin Breitner (Jimmy Stewart), just make it into the shot. Unlike in Mrs. Miniver, however, the effect is not suffocating. Instead, just as in the classroom, this scene sets a bar of normalcy against which future changes should be measured. By the conclusion of the film, the table and the domestic space are empty. As one of the brothers makes his way through the house in the final scene, we hear the voices of his now deceased or exiled family members. 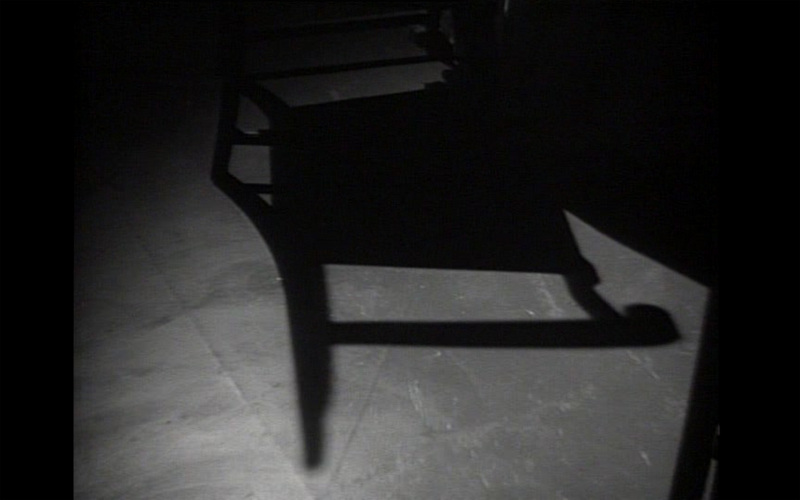 This continuous two-minute tracking shot through the house pauses only to tilt down and zoom in on the shadows of household décor (a chair, an award) left behind (fig. 10). The previously filled dining room has been abandoned and all that remains is a faint echo of the unity and free thinking this home once represented. As the camera focuses in for a close-up on the crisp shadow of an empty dining room chair, centrally positioned in the frame just as the Professor once was, the similarities between this moment and the book-burning classroom scene are notable. Once again, the use of hard lighting significantly diminishes the filmic space, causing a darkening on both the right and left sides of the frame. By setting the film’s final moments in a domestic space, albeit one that now contains only echoes and shadows of its previous inhabitants, The Mortal Storm emphasizes the traumatic impact war has on family life. Figs. 9 and 10. Home full and empty in The Mortal Storm. As in Mrs. Miniver, where objects express melodramatic tensions between pathetic highs and lows, the spectral object-filled ending of The Mortal Storm articulates both devastation and hope. The shadows within the domestic space certainly suggest the destruction of the Roth family (and, symbolically, anyone sympathetic to democracy under Nazi rule), but these ghostly traces also imply that the house will continue to keep safe these domestic memories long into the future. In this way, The Mortal Storm anticipates the work of Gaston Bachelard, who argues that domestic spaces act as signifiers of our most personal and intimate memories. As he writes in The Poetics of Space, “the house is not experienced from day to day only, on the thread of a narrative, or in the telling of our own story. Through dreams, the various dwelling-places in our lives co-penetrate and retain the treasures of former days.” The Mortal Storm asks us to intensify the act of private remembrance to accommodate the collective memory of a family (the Roths), a people (the Jews), and a nation (pre-Nazi Germany). In an era of total war, where private spaces such as homes are co-opted for public use, where the domestic arena becomes a battlefront, and where daily household items are collected and rationed for the war effort, the empty Roth home and the traces of objects and voices left behind suggest that individual remembrance is not enough. Thus, despite The Mortal Storm’s dark final setting, the ghostly voiceovers paired with the shadowed objects in an abandoned house imply that the Roth family will, through the domestic space and collective memory, continue to live on. The question that emerges from this use of architecture and housewares within MGM’s wartime filmic spaces is: whose home front and whose domesticity is really being represented? Although set in Britain and Germany respectively, the domestic spaces of Mrs. Miniver and The Mortal Storm represent more than the European nations suffering under Nazism. These films specifically play up one of America’s greatest concerns: the potential loss of a domestic peace that had come to be taken for granted. To achieve this blurring of location these films project an ideal American vision onto its European settings. For example, like an increasing number of Americans, the Minivers and Roths live in large, upper-middle-class homes on the outskirts of a major metropolis; the family unit of mother, father, and loving children is stereotypically intact. In the filming of Walter Pidgeon, Jimmy Stewart, and Frank Morgan, there was not even an attempt to hide their American accents. Were it not for the wartime plot, Mrs. Miniver could be mistaken for a film set in an American suburban home, the ideal retreat out of the cities to which American families were moving. Of course, this easy confusion of foreign and American domesticity is what makes Mrs. Miniver such a powerful piece of propaganda. If radio broadcasts such as Edward R. Murrow’s “London is Burning” brought the war into the private spaces of American homes, then MGM’s domestic wartime dramas emphasized to a public audience that the peace Americans were living was in peril. The only hope, as these films suggest in their concluding scenes, is for the Allies and like-minded thinkers to continue the fight against Nazism. MGM’s message to American viewers was simple: under the threat of Nazism, no home is safe. Thus death is construed as the consequence of inaction and domestic slumber. Ultimately, Mrs. Miniver the film was, like its prose template, powerful propaganda without being explicitly labeled a war production. President Roosevelt is said to have been so moved by the film’s closing speech that he had it printed as a pamphlet and dropped all over Europe, and Prime Minister Winston Churchill claimed that Mrs. Miniver would contribute more to the Allied cause than a flotilla of battleships. Even Joseph Goebbels, Germany’s Minister of Propaganda, believed the film to be so effective that he ordered it to be studied by his ministry. And while British critics were irritated by Hollywood’s “distortion” of both the book and the war, many agreed that the film would help the British image in the eyes of Americans. But Mrs. Miniver’s success, both at the box office and as wartime propaganda, is also due to MGM’s larger investment in adapting middlebrow literature, especially that written by and for women. Rather than focus explicitly on combat or politics, these texts and their adaptations worked to draw similarities between Britain and the United States by telling stories about marriage, children, everyday life, and most significantly the home. The onscreen disruption of this idyllic space, one with which American viewers (particularly American women) could relate, helped garner some much needed sympathy for the British at a critical moment in the war. I would like to thank Barbara Green and Chris Becker for reading an early version of this essay as well as the editors and readers at Modernism/modernity for their generous feedback. Quoted in Axel Madsen, William Wyler: The Authorized Biography (New York: Open Road Distribution, 2015), 214–15. George Orwell, “Charles Dickens,” in The Collected Essays, Journalism and Letters of George Orwell, vol. 1, ed. Sonia Orwell and Ian Angus (New York: Harcourt, Brace and World, 1968), 448. Mark Wollaeger, Modernism, Media, and Propaganda: British Narrative from 1900 to 1945 (Princeton, NJ: Princeton University Press, 2006), xvi. In the nineteenth century, the term “propaganda” referred to information used to persuade populations on issues of national and social importance. It was not until World War I, and the contemporaneous development of mass-communications media, that the large-scale manipulative possibilities of propaganda were realized. Thomas S. Davis, The Extinct Scene: Late Modernism and Everyday Life (New York: Columbia University Press, 2016), 68, 6. Laura Mulvey, Visual and Other Pleasures: Language, Discourse, Society, ed. Stephen Heath, Colin MacCabe, and Denise Riley (New York: Palgrave, 1989), 64. See Marina MacKay, Modernism and World War II (Cambridge: Cambridge University Press, 2007) and Patrick Deer, Culture in Camouflage: War, Empire, and Modern British Literature (Oxford: Oxford University Press, 2009). Upon seeing the film version in 1942, Vera Brittain wrote critically in her diary of the film’s “sweet sentimentality” and the “silly” behavior of characters that do not know how to “give even elementary first-aid.” Brittain admitted, however, that she was moved by the Blitz and Dunkirk scenes “despite the propagandistic intention of the whole thing” (Vera Brittain, Wartime Chronicle: Vera Brittain’s Dairy 1939–1945, ed. Alan Bishop and Y. Aleksandra Bennett [London: Victor Gollancz, 1989], 169). Linda Williams, “Melodrama Revised” in Refiguring American Film Genres: History and Theory, ed. Nick Browne (Berkeley: University of California Press, 1998), 42–88, 42. Emphasis added. See also Christine Gledhill, “The Melodramatic Field: An Investigation” in Home is Where the Heart Is: Studies in Melodrama and the Woman’s Film, ed. Christine Gledhill (London: BFI Publishing, 1987), 5–40, and Frank Kelleter and Ruth Mayer, “The Melodramatic Mode Revisited: An Introduction” in Melodrama! The Mode of Excess from Early America to Hollywood, ed. Frank Kelleter, Barbara Krah, and Ruth Meyer (Heidelberg: Universitätsverlag, 2007), 7–18. Peter Brooks, The Melodramatic Imagination: Balzac, Henry James, Melodrama, and the Mode of Excess (New Haven, CT: Yale University Press: 1995). Northrup Frye, Anatomy of Criticism (Princeton, NJ: Princeton University Press, 2015), 47. See Sally Faulkner, Middlebrow Cinema (New York: Routledge, 2016); Lucy Fischer, Designing Women: Cinema, Art Deco, and the Female Form (New York: Columbia University Press, 2013); Laura Heins, Nazi Film Melodrama (Urbana: University of Illinois Press, 2013). See Coral Lansbury, “Melodrama, Pantomime, and the Communist Manifesto,” Browning Institute Studies 14 (1986): 1–10. See Ben Singer, Melodrama and Modernity: Early Sensational Cinema and Its Contents (New York: Columbia University Press, 2001), 44–49. Jonathan Auerbach and Russ Castronovo, “Introduction: Thirteen Propositions about Propaganda,” in The Oxford Handbook of Propaganda Studies, ed. Jonathan Auerbach and Russ Castronovo (Oxford: Oxford University Press, 2013), 1–18, 7. Emphasis in original. In her comparison of German and Hollywood wartime melodramas, Heins notes a significant difference in the emphasis on home front settings: “Since the battlefields remained far from the American continent, Hollywood cinema had to work more intensely to bring the war closer to the viewer’s consciousness than did the Nazis, who wanted instead to contain the damage to spectator morale caused by the ever intensifying bombing of German cities. Thus, Nazi films underplayed the collapsing of home into front while Hollywood films worked in the other direction” (Nazi Film Melodrama, 143–44). For example, Alfred Hitchcock’s Rebecca (1940) and Suspicion (1941) do not explicitly concern the war, but in their violent marital strife, the two films speak to the brutal age in which moviegoers found themselves. In the process, the films further unsettled the already troubled home front. See Thomas Schatz, “World War II and the Hollywood ‘War Film,’” in Refiguring American Film Dramas: History and Theory, ed. Nick Browne (Berkeley: University of California Press, 1998), 89–128, 94, 103. Heins notes that Hollywood was so prolific in churning out war-themed films that by the end of WWII Hollywood had produced ten times more than the Nazi-controlled studios. See Nazi Film Melodrama, 146. For example, like Mrs. Miniver, The White Cliffs had a hugely successful print run and radio broadcast. Likewise, Phyllis Bottome’s The Mortal Storm and James Hilton’s Goodbye, Mr. Chips and Random Harvest were avidly read, with Random Harvest coming in second on The New York Times annual best-selling novels list. Alison Light, Forever England: Femininity, Literature and Conservatism between the Wars (New York: Routledge, 1991), 114. Britain’s unpreparedness was a common theme among British novelists writing during or about the early war years. See Evelyn Waugh’s Put Out More Flags (1942), Henry Green’s Caught (1943), and Graham Greene’s The Ministry of Fear (1943). Mrs. Miniver earned $8,878,000 at the box office, netting a profit of $4,831,000 (over a quarter of MGM’s total profits in 1942). The film ran at Radio City four weeks longer than any other film, and was only removed for Walt Disney’s Bambi. See H. Mark Glancy, “MGM Film Grosses, 1924–1948: The Eddie Mannix Ledger,” Historical Journal of Film, Radio and Television 12, no. 2 (1992): 127–45, 138; Michael Troyan, A Rose for Mrs. Miniver: The Life of Greer Garson (Lexington: University Press of Kentucky, 1999), 148; Ysenda Maxtone Graham, The Real Mrs. Miniver: A Biography (New York: St. Martin’s Press, 2001), 2; and Clayton R. Koppes and Gregory D. Black, Hollywood Goes to War: How Politics, Profits, and Propaganda Shaped World War II Movies (New York: Free Press, 1987), 223. For more on West’s role within the British government, see Alexis Pogorelskin, “Phyllis Bottome’s The Mortal Storm: Film and Controversy,” The Space Between 6, no. 1 (2010): 39–58. In this essay, the lack of fidelity between book and film is not my primary concern. The problem with fidelity criticism is that it assumes one single correct reading of a text, which the film is then supposed to present. Brian McFarlane argues that such a stress on fidelity ignores a film’s (and for that matter a novel’s) intertextuality; by this he means “those non-literary, non-novelistic influences at work on any film, whether or not it is based on a novel. . . . Conditions within the film industry and the prevailing cultural and social climate at the time of the film’s making,” for example (Novel to Film: An Introduction to the Theory of Adaptation [Oxford: Clarendon, 1996], 21). For transnational adaptation scholars like Regina Schober, this intertextual or network-studies approach to adaptation is central to understanding adaptations not only across national lines, but media ones too. See Regina Schober, “Adaption as Connection—Transmediality Reconsidered,” in Adaptation Studies: New Challenges, New Directions, ed. Jørgen Bruhn, Anne Gjelsvik, and Eirik Frisvold Hanssen, (London: Bloomsbury, 2013), 89–112. There is not, however, unilateral support for this intertextual model. In Transatlantic Perspectives from Fidelity to History, Ann-Marie Scholz makes the convincing case against fidelity and intertextual models, claiming that both methods “ultimately privilege the ‘textual’ or ‘literary’ aspects of the literature/film relationship, either by prioritizing the former or by eliminating all notions of historical materialism in favor of a ‘free play of signification’” (Transatlantic Perspectives from Fidelity to History: Film Adaptations as Cultural Events in the Twentieth Century [New York: Berghahn, 2013], 2). Instead, Scholz argues we should use case study methodologies to investigate the temporal and spatial identities of the adaptations and the ways in which “texts are transformed into other media and received by audiences in very concrete, materialistic ways.” (Transatlantic Perspective, 3). While it may seem unusual to associate “prestige” with “melodrama,” a term typically used today to describe “female-centered and oriented dramas,” according to Barry Langford, the term “melodrama” was not a value judgment in the 1940s. Rather, “melodrama” was a huge business for studios that impacted multiple genres and sought to reveal “moral and emotional truths” (Barry Langford, Film Genre: Hollywood and Beyond [Edinburgh: Edinburgh University Press, 2005], 31). MGM’s brand was under attack from numerous outside influences, including a Justice Department intent upon upending Hollywood’s monopoly, a Congress who wanted to root out Communism, a postwar Britain interested in increasing its own film production, and television. For Jerome Christensen, Mrs. Miniver marks Louis B. Mayer’s and MGM’s visual attempt to “develop a postwar strategy to preserve not merely profits but its corporate identity,” and his sophisticated reading of the film as a glorification of MGM’s corporate culture and American capitalism is convincing to say the least (“Studio Identity and Studio Art: MGM, Mrs. Miniver, and Planning the Postwar Era,” ELH 67, no.1 : 257–92, 259). But to think of the movie as “postwar” misses some of the essential war aspects of the film, which were influenced by the slowly turning tide of American public opinion and more significantly by its pro-intervention director, William Wyler, who explicitly stated that Mrs. Miniver was intended to be “a strong piece of pro-British propaganda” (quoted in Jan Herman, A Talent for Trouble: The Life of Hollywood’s Most Acclaimed Director, William Wyler [New York: G. P. Putnam’s Sons, 1995], 234). See Deer, Culture in Camouflage, 113. Elizabeth Bowen, Ivy Gripped the Steps and Other Stories (New York: Alfred A. Knopf, 1946), xii. Within the field of literary modernism, much has been written about British cultural production during WWII. For example, in Culture in Camouflage, Deer defines “war culture” as “work and practices produced during wartime and also those that actively constitute part of the war effort” (4). This culture is produced through state-official channels of “propaganda, censorship, film, speeches, press, and radio statements, recruiting materials and training manuals, as well as the work of officially sponsored war artists and writers” and also by those writers, like Bowen (or Struther), who “camouflage” their acts of resistance to the dominant wartime narrative through subversive literary forms (4). In Reading the Ruins, Leo Mellor argues that the material conditions of war, specifically bombsites and ruins, influence British cultural production and “provide the subject of many works, whether overtly or implicitly” (Leo Mellor, Reading the Ruins: Modernism, Bombsites and British Culture [Cambridge: Cambridge University Press, 2011], 2). But whereas Deer and Mellor focus largely on British literature (and to a certain degree photography and film), they do not take into account the ways in which these cultural materials were adapted to sell the war differently on two sides of the Atlantic. By using a case study approach for Mrs. Miniver, I hope to underscore the mutability of British wartime culture both in messaging and in medium and highlight the transatlantic influence which shaped wartime cultural objects for national and international consumption. While the original Times pieces ran between 1937 and 1939, these narratives were also collected and published as a book. Chatto and Windus published the British version in 1939, and in 1940 Harcourt Brace followed with a New York imprint. Throughout this essay, I point to the significance of these dates, as British readers first came into contact with Mrs. Miniver in a pre-war state. Americans, on the other hand, know her as a wartime figure. As a result of different release dates, Mrs. Miniver’s steadfastness takes on different meanings for British and American audiences. Jan Struther, Mrs. Miniver (Philadelphia: Harvest Books, 1990), 75. “The Issue Defined,” Times, September 28, 1938, 11. Also in this issue, James Bond author, Ian L. Fleming, outlined the possibilities available to Britain to keep her out of the war (“To The Editor Of The Times,” Times, September 28, 1938, 12). This moment is, as Alison Light writes, Struther’s attempt at “attack[ing] readers’ apathy and the ever-present desire to ignore ‘the Jewish question’” (Forever England, 150). See Light, Forever England, 114–15. Neville Chamberlain made the declaration “Peace for our time” in a speech on September 30, 1938, after the signing of the Munich Agreement. Two days after Chamberlain’s speech, the London Times published a full page spread titled “Declaration of Peace at Munich.” Chamberlain’s famous phrase is quoted in the sub-article “Ovation in London,” Times, October 1, 1938, 12. See Troyan, A Rose for Mrs. Miniver, 124–25. The class status of the Minivers is debatable. Although the film’s prologue claims that this is the “story of an average English middle-class family,” what we see on screen in terms of the Miniver’s home, purchases, and leadership in the community calls into question both their “average[ness]” and their “middle-class[ness]” (Mrs. Miniver, directed by William Wyler [1942; Burbank, CA: Warner Home Video, 2005], DVD). However, the Minivers on screen are of a lower class than they are in the book. In Struther’s version, the family owns two homes, one in London and one in the countryside (and are thinking about buying a third). This is a level of wealth we do not see in the film. The book also spends a fair amount of time discussing the Minivers’ familial connections to the landed class. According to Jerome Christensen, Louis B. Mayer was so averse to including propaganda in MGM films that he wanted the Nazi-in-the-kitchen scene balanced out by a scene in which “a good Nazi” is introduced to the audience. A large reason for Mayer’s hesitancy to include Allied propaganda was based in his desire to keep foreign film markets open to MGM for as long as possible (Christensen, “Studio Identity and Studio Art: MGM, Mrs. Miniver, and Planning the Postwar Era,” 265). Also noteworthy are the reoccurring British screenwriters for MGM’s domestic dramas: James Hilton (novelist known for Lost Horizon, Random Harvest, and Goodbye, Mr. Chips, which all became MGM films); Arthur Wimperis (illustrator and playwright); R. C. Sherriff (English playwright best known for Journey’s End), and Claudine West (screenwriter on The White Cliffs of Dover and The Mortal Storm). Due to an agreement made with the studio, Gibbons was credited as art director on every US picture MGM made, which means that he at times took credit for films that he had little to do with. One of the more powerful department heads, Gibbons was often one of the first people to receive a film’s script. He and his department were then tasked with starting the film’s visualization process. But as Christina Wilson points out, even when the work was passed off to one of Gibbons’s subordinates, he “remained an active and integral part of the design process,” getting frequent progress reports from the art director he assigned to a film (Christina Wilson, “Cedric Gibbons: Architect of Hollywood’s Golden Age,” in Architecture and Film, ed. Mark Lamster [New York: Princeton Architectural Press, 2000], 101–116, 103) The result of Gibbons’s heavy hand was that MGM had a very recognizable aesthetic that stemmed from Gibbons’s specific point of view. Cathy Whitlock, Designs on Film: A Century of Hollywood Art Direction (New York: Harper Collins, 2010), 23. Taking his phrase from Bowen’s “In the Square,” in The Extinct Scene, Davis argues that in late modernism objects betray the stress of the times as well as historical change. Of the “extinct scene,” he writes: “is not just an evacuated, ravaged war zone; it is the place where we glimpse an uneasy coexistence of familiarity and disorientation, of everydayness and history. Those places, memories, things, and habits that ground experience and knowledge become unsettled and draw attention like a magnetic field” (2). Bill Brown, “Thing Theory,” Critical Inquiry 28, no. 1 (2001): 1-12, 16. Brown, here, is summarizing the argument made by Lesley Stern in “Paths That Wind through the Thicket of Things,” Critical Inquiry 28, no.1 (2001): 317–354. Thomas Elsaesser, “Tales of Sound and Fury: Observations of the Family Melodrama” in Imitations of Life: A Reader on Film and Television Melodrama, ed. Marcia Landy (Detroit, MI: Wayne State University Press, 1991), 68–91, 84. ASL is calculated by taking the number of shots in a film and dividing it by the film’s running time (minus credits). For Mrs. Miniver, my ASL calculation was 11.8 seconds per shot. I calculated the steady pace of Mrs. Miniver’s ASL by splitting the film into thirds based on major plot moments: declaration of war and Nazi in the kitchen. In each third, the ASL stayed within 11.2 and 12.2 seconds. David Bordwell calculates the evolution of Hollywood ASL in The Way Hollywood Tells It: Story and Style in Modern Movies (Berkeley: University of California Press, 2006), 121. In this story, “In the Square,” Bowen represents the wartime changes to people and places through objects. Lives and places are chaotic but somehow continue functioning. This is the same toppling world that Clem, an architect with a Canadian-American accent, will have to repair, further implying the restorative role the United States will have to play postwar. See Christensen, “Studio Identity and Studio Art,” 285. Christensen points out that Wyler’s use of deep focus often features the Minivers’ staircase to portend this death. See Christensen, “Studio Identity and Studio Art,” 276. The Miniver’s casual reaction to their bombed home may at first seem to present the “Britain Can Take It” message that Humphrey Jennings’s Listen to Britain and London Can Take It put forth. As Davis writes, these documentaries ask us “to listen to and to see everyday life under extraordinary conditions as remarkably ordinary” (The Extinct Scene, 44). But whereas Jennings’s goal was to “manage” and “defuse” a viewer’s stress, the melodramatic situational settings of Mrs. Miniver have the opposite effect (46). This is not an ordinary day, but the return of the honeymooners. By all accounts this is an extraordinary event, one that blends happiness with sorrow and foreboding. The myth of the People’s War has been much debated. On the one hand, the war impacted more British lives than any previous, which naturally meant a greater involvement by civilians across socio-economic statuses. However, the idea that this widespread involvement would lead to the dissolution of class lines was more a government propaganda narrative than an actuality. See Chapman, The British at War, 161–62. See also Angus Calder, The People’s War: Britain, 1939-1945 (New York: Pantheon Books, 1969); Angus Calder, The Myth of the Blitz (London: Jonathan Cape, 1991); Sonya O. Rose, Which People’s War? : National Identity and Citizenship in Wartime Britain 1939-1945 (Oxford: Oxford University Press, 2004). During the war, British and American writers including Dorothy Sayers, T. S. Eliot, and C. S. Lewis also championed a return to Christian basics. This shot’s oppressiveness is further emphasized by its contrast with the previous Alps chase scene, which used quick jump and match-on-action cuts to heighten the tension. Gaston Bachelard, The Poetics of Space, trans. The Orion Press (Boston, MA: Beacon Press, 1994) 5. Although The Mortal Storm is set in Germany, the film reflects the sufferings of democracy-loving Allies. Throughout the film those who suffer are positioned as non-German. They are either pacifists, apolitical mountain-dwelling peasants, or Jewish (although the word “Jew” is never once spoken in relation to the Roths). According to Jonathan Bell, between 1940–1947 approximately 65 million people (or one-half of the US population) moved to new (often suburban) homes: “The demographic shift around the country was remarkable: people from the countryside were relocating to urban and suburban areas, and people who had previously lived in city centers were now moving to the suburbs” (“Shadows in the Hinterland: Rural Noir,” in Architecture and Film, 217–30, 219–20). Heins notes that “Mrs. Miniver was shown in closed screenings to German military personnel and filmmakers and was called an ‘exemplary model for the treatment of contemporary subjects’ by an RMVP official” (Nazi Film Melodrama, 220). See Troyan, A Rose for Mrs. Miniver, 149–150. A correspondent for The Times (the publisher of Struther’s Mrs. Miniver) acknowledged that despite criticisms of the portrayal of English life, the film “is generally accounted here one of the most effective pieces of propaganda for Great Britain since the war began” (“News in Brief,” Times, August 17, 1942, 3). Melissa Dinsman is Assistant Professor of English at York-CUNY and author of Modernism at the Microphone: Radio, Propaganda, and Literary Aesthetics During World War II (Bloomsbury 2015). Her most recent work can be found in Contemporary Women’s Writing, The Space Between and the L.A. Review of Books, and n+1 online.